Dr Groberg joined our staff in June of 2011. She graduated from UCF with a B.S. in Biology in 1997, and she went on to graduate from UF College of Veterinary Medicine in 2001. 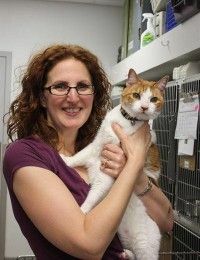 For 10 years Dr. Groberg practiced medicine in feline exclusive practices, but she is excited to now be caring for dogs as well. In her spare time she enjoys reading, exercising, watching movies, and spending time with her husband and their 2 beautiful daughters. At home she has 2 dogs Lilo and Stitch and 2 cats Jewel and Fiona the three-legged wonder cat. Pictured with her cat Nacho, who survived cancer for over 6 years.